LOS ANGELES (January 14, 2019) — American Federation of Musicians Local 47 proudly stands with the thousands of brave workers who are striking for our communities, our families and our children. Members of the United Teachers Los Angeles union are taking a stand to be treated with dignity and respect. The Los Angeles Unified School District is the second largest in the country, yet our schools are painfully underfunded, understaffed, and overcrowded. The numbers say it all: California ranks 43 out of 50 in per-pupil spending. We rank 48 out of 50 in student-to-teacher ratio, and our student-to-counselor ratio is 945:1. Cost of living has increased 27% since 2008, but wages are so low that many teachers are forced to take a second job to support their families. Yet while LAUSD sits on a nearly $2 billion reserve, they refuse to agree to fair terms at the bargaining table. This fight is personal. We have children who attend LAUSD schools; we have colleagues who work at LAUSD schools; and many of us teach at LAUSD schools ourselves. As professional musicians we understand what it means to be a worker whose professional calling helps build community, and we recognize the critical role teachers play in this pursuit. AFM Local 47 fully rejects the display of greed shown by the LAUSD Board of Education and calls upon them to solve this dispute immediately and fairly, and put our teachers and students back in the classroom. AFM Local 47 is proud to have adopted Toluca Lake Elementary School. Musicians and members of the community at large who would like to help us support our neighborhood LAUSD school during the strike may sign up by sending an email to press@afm47.org. 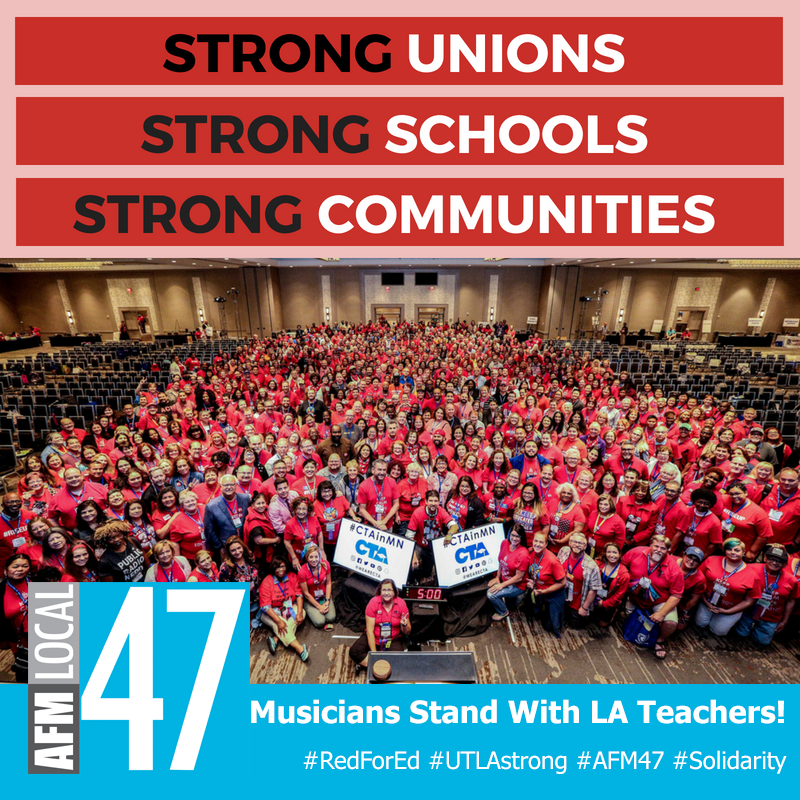 About AFM Local 47 – Local 47 is a labor organization formed by and for musicians over a century ago that promotes and protects the concerns of over 7,000 musicians throughout the greater Los Angeles area in all facets of the music business. Local 47 is affiliated with the American Federation of Musicians of the United States and Canada, the largest organization in the world representing the interests of 85,000 professional musicians. This entry was posted in All News, Press Releases and tagged LAUSD, solidarity, teacher strike, UTLA on January 14, 2019 by admin.